I attended the 2016 Gooch’s Garlic Run earlier this week. I have written about this annual event before. It’s for a good cause and each year a few thousand bikers show up for the annual ride to downtown Newark. There are thousands of motorcycles here. It’s one of New Jersey’s largest motorcycle events. I saw more Harley-Davidson Street Glide models than any other. Maybe it’s a New jersey thing. There were a lot of mounts on these bikes. 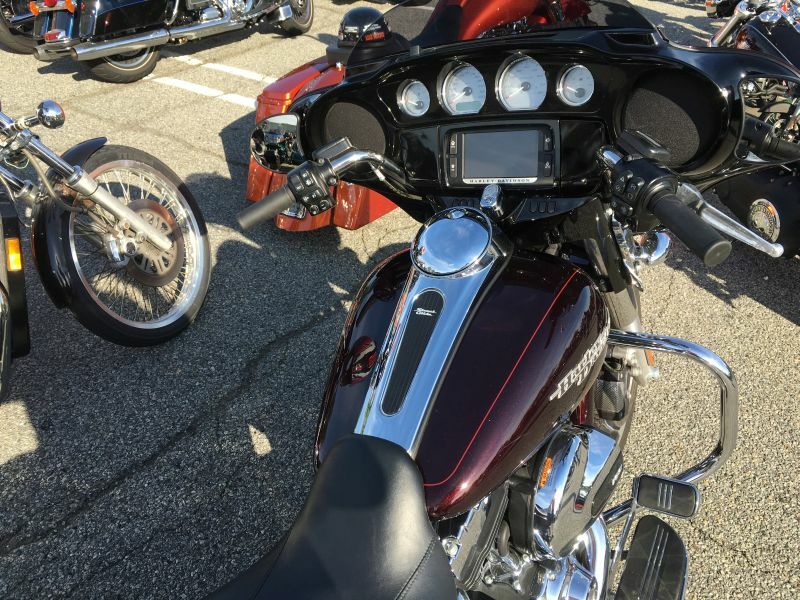 So, here’s our article about mounts and holders for Harley-Davidson Street Glide motorcycles. The photo that accompanies this article is a Harley-Davidson Street Glide cockpit. You can see there is a lot of different places to mount a cell phone, GPS, camera or satellite radio. This is one of the easier motorcycle models to mount a device. Nothing special about the diameter of the Harley-Davidson Street Glide handlebar. It comes in at a standard 1.25 inches in diameter. There’s lots of handlebar real estate on each side of the stem. This is great news for people who like to mount devices on their handlebar. The clutch is another good place for mounting. I prefer the handlebar but some prefer the clutch as it looks a little cleaner. For motorcycle use, it’s important that you select a mount that has a well constructed cradle that is going to hold your phone tightly so that it stays secure in high vibration environments. The RAM X-Grip line of mounts continues to a be a favorite for motorcycle use. We wrote a very detailed article on the X-Grip series which you can read here. Most smartphones, especially with a case or skin, can use the RAM X-Grip IV Handlebar Mount. These are heavy duty mounts that are mostly constructed of metal. The mount has gone through some rigorous shake tests and holds up well on a motorcycle. These mounts feature the expandable X-Grip IV cradle which can open to 4.5 inches which is large enough for almost any phone. These mounts attach to your handlebar and allows complete 360 degree rotation of your phone. The manufacturer now includes a safety tether with these mounts which is a nice added touch. These come with a lifetime warranty from RAM. A similar mount which will fit the clutch on a Harley-Davidson Street Glide is the RAM Brake/Clutch Reservoir Mount with Universal X-Grip IV Phone Cradle. These come with a set of bolts that will replace the factory bolts that came with your Harley-Davidson Street Glide. They are a little longer than the original bolts to accommodate the added length of the mounting post. These are more difficult to install than your basic handlebar mount so be sure to follow the directions and use a mechanic if not comfortable working on your motorcycle. This mount has the same cradle as the handlebar model opening to 4.5 inches. A good entry-level mount with that 17mm ball that is marketed for motorcycle use is the Arkon Handlebar Mount for Garmin Nuvi and Garmin Drive GPS. These fit handlebar diameters up to 1.25 inches and include a rubber strip to prevent marring of chrome surfaces. While you can install the mount without the rubber strip, we recommend using it to protect your finish. These mounts are attached with a screwdriver to tighten the two bolts. A higher priced but better made handlebar mount is the Arkon Premium Aluminum Motorcycle Garmin GPS Motorcycle Mount. These will fit your Harley-Davidson Street Glide handlebar just fine and like the previous mount, it has a 17mm ball on the end. It’s made of metal and installs with the included hex wrench. Keep the wrench in the saddlebag when finished because you will lose it if thrown into your garage toolbox. I mentioned the clutch on a Harley-Davidson Street Glide as a popular location for mounting. Techmount manufactures a well made Harley-Davidson and Metric Control Mount Kit that features a 17mm ball. As previously mentioned that’s the same size ball that Garmin uses for the back of their GPS cradles. This part comes with stainless steel bolts that will replace the current manufacturer bolts. If you would like to mount a phone, you can add the Techmount TechGripper Cradle to the mount. This makes this particular mount a dual purpose mount. Add the cradle when you want to use it for your phone. Remove the cradle when it’s time for a GPS. There are even several inexpensive adapters that permit the installation of cameras or even specialized adapters for the ever popular GoPro series. I mentioned earlier that there are a lot of riders opting to mount a camera on their Harley-Davidson. There are many camera mounts available for your handlebar but they aren’t all well suited for motorcycle use. A camera has a unique requirement to minimize vibration. Some higher end cameras have technology embedded into the software to minimize this affect. Most do not. Buying a plastic mount with a tripod screw embedded is likely to yield a very shaky video so you will want to find a mount that has vibration dampening technology. The RAM Handlebar Rail Mount for Cameras has been proven over many years to be the best out there for this purpose. Using a plastic mount without dampening features will likely result in a very dizzy viewer. Opt for the better metal variety from RAM.